JP Morgan tokenising gold is big news as they have a dominant position in physical and paper precious metal markets. Digging deeper, however, I found it is more fake news than big news. I came across this headline from a user posting this link in the Vaultoro Discord channel (I spoke with Joshua at the Precious Metals Symposium in Perth recently, Vaultoro has some interesting developments planned, you can check out his presentation at the conference here). I first tried to verify the statement by checking the JP Morgan Quorum website, which you would think would mention it, but there is nothing there about gold or indeed any application of the platform. A google search shows a lot of republication of the article by various crypto media but the original article appears to be from this CNN post. They don't provide any direct source for their opening statement "US banking giant JPMorgan Chase Bank’s blockchain, Quorum, will be used to “tokenize” gold bars" but following the link they provide to this AFR article, the quote them picked up on is "A blockchain platform built by global investment bank JP Morgan is being used to "tokenise" gold bars to allow sustainable miners to earn a premium on global markets". There are people outside our firm using Quorum to tokenise gold, for instance," he told The Australian Financial Review on the sidelines of Sibos. "They wrap a gold bar into a tamper-proof case electronically tagged, and they can track the gold bar from the mine to end point – with the use case being, if you know it's a socially responsible mine, someone will be willing to pay a higher spread on that gold versus if you don't know where it comes from. Diamonds is another example." The "he" in this quote is "JP Morgan’s New York-based head of blockchain initiatives, Umar Farooq". The reference to tamper-proof case, socially responsible mining and diamonds is a clear reference to Emergent Technology Holdings' G-Coin, which uses Quorum. I spoke to them at the Singapore Bullion Market Association (SBMA) Asia Pacific Precious Metals Conference in June and unlike a lot of gold crypto projects this one is actually credible, addressing a real need by wholesale gold consumers with ESG (Environmental, Social and Governance) requirements. Only question I had was how much premium above spot the kilobars would sell for, as each bar has its own plastic case plus each tracked batch or dore must be refined independently (which breaks the usual refinery economies of scale) but they weren't able to provide an answer. So in summary it seems that the crypto media misread the "will be" that CNN changed from the "is being" in the original AFR article. Just shows how fake news propagates, in this case because there are few websites these days with journalistic standards with most so-called news website not being bothered to do the simple research I just did or simply call the quoted firm to confirm the facts. Below is a series of post explaining how bullion banking operates, which is necessary for a true understanding of how susceptible it is to a gold bank run, as well as understanding how a price suppression (as opposed to manipulation) would work, in respect of what backs paper gold and how much physical is needed to support the system. 2. 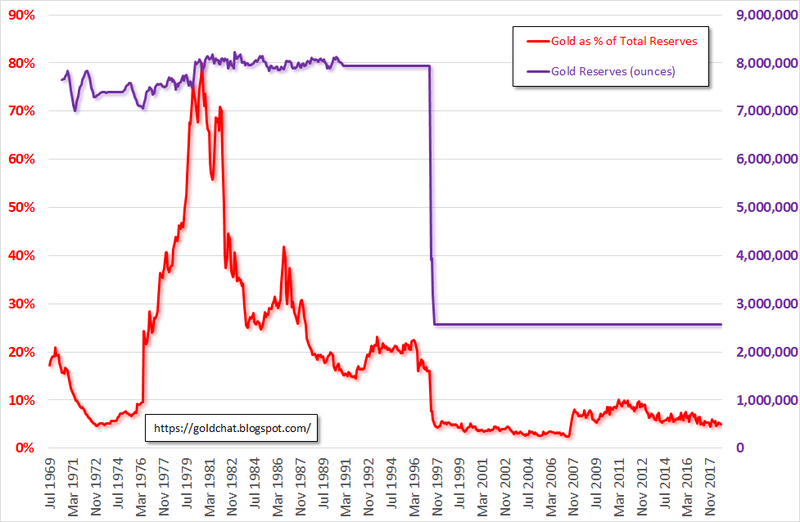 Fractional reserve bullion banking and gold bank runs - a bullion bank's "assets"
10. Fractional reserve bullion banking and gold bank runs: a run or stroll? 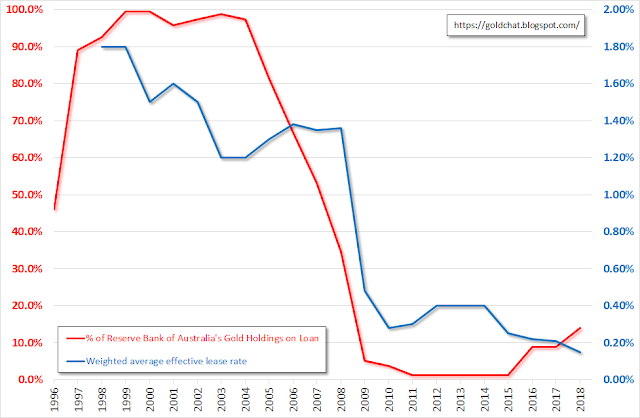 Has the Reserve Bank of Australia lost some of its gold reserves? Martin North of Digital Finance Analytics implies as such in The Mystery Of The Missing Australian Gold where he "discuss[es] the current state of Australia’s Gold holdings, and where 11 tonnes may have gone" with economist John Adams and then raises questions about the audit of Australia's gold in a follow up YouTube. As is the case with most clickbait type headlines, the gold isn't missing nor is it a mystery, but that doesn't mean John hasn't raised valid questions. I will first address some misconceptions raised in the videos then discuss the audit. At 15:50 John talks about the bars having a serial number and "emblem of the nation" and that the "Australian crest" will be stamped on the bar. This is not the case. The global standard for bullion traded in the professional gold market is detailed here and requires that bars are stamped with the brand of the refinery that made the bars, a serial number, purity and year of manufacture. Bars do not have any markings indicating who owns them and indeed anyone asking for physical allocation will usually receive a mix of bars from different refineries, as long as they are on the accredited list. At 18:28 John discusses the interest income of $710,000 the RBA received on leasing out its gold and calculates an effective rate of 0.12%. This calculation is not correct as he is using the 30 June balance when the amount leased during the year may have changed. The RBA annual report does actually provide an accurate "weighted average effective lease rate" on page 177, which for 17/18 was 0.15%. John and Martin then go on to discuss how this rate is non-commercial and compare it to the treasury 10 year rate. In the chart below I have graphed in blue the average rate reported by the RBA in its annual reports since 1998. While 0.15% or even 0.40% may seem low to those outside of the bullion markets, they are reflective of gold lease rates in general, which are available here. The chart below is from that link and shows the derived (ie LIBOR - GOFO) gold lease rate for a lease of 6 months duration (note that the chart stops in 2015 as GOFO benchmarks ceased that year and full lease rate data is only available on paid subscription sites with some derived data being produced by Monetary Metals for free if you sign up). Having said that, the 0.15% in my opinion is too low notwithstanding the RBA is lending on a collaterised basis or to entities with "government support". 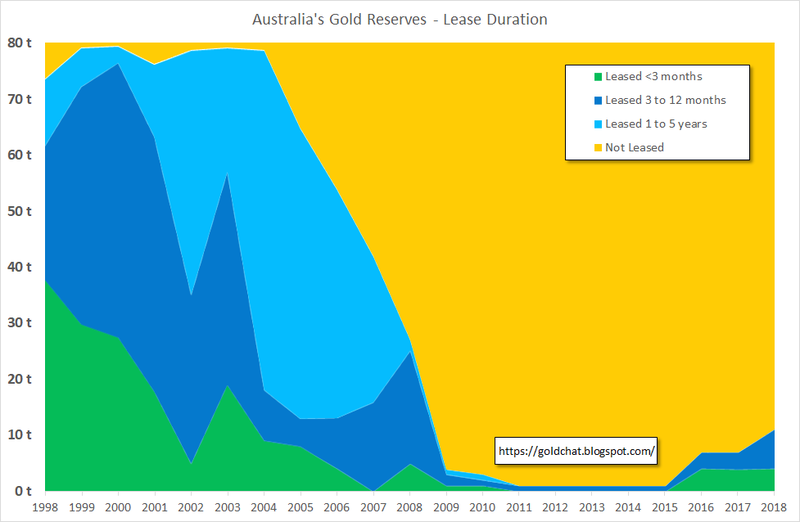 The red line on the previous chart shows that the RBA was pretty much lending out all of Australia's gold reserves prior to 2005 but sharply pulled out of the market as its longer term (1-5yr duration) leases matured (see this post for charts on the RBA's gold lease duration mix) into a market where lease rates were sub 0.40%. It clearly didn't think the risk/return tradeoff was right at the time and that was prescient considering the GFC hit in 2008. If the RBA is willing to increase its gold leases at 0.15% it must now consider everything has been fixed and financial risks are low! At 21:50 John talks about what he calls the linchpin question, which is whether the RBA will accept repayment of the lease in non-physical form. If yes, then he believes this means that Australia's 11 tonnes of leased gold has been melted down and this I think is where he gets the idea the gold is "missing". I was intially puzzled at John's logic until I realised that he is probably being confused by the gold industry's use of the term "lease" and naturally would assume a common meaning, that is, that leased goods shoud be returned after use. "In the case of lenders supplying actual physical bars (usually only be Central Banks) because it is understood that leased metal will be "used" (be that in a physical operation like a jeweller or mint, or for sale to create a short position), the contract cannot practically require the return of the same physical bars that were lent (ie the same bar numbers). If the lease contract was worded on a secured basis (most likely where the borrower is a jeweller or mint) the security would have to be against the general gold stocks of the borrower rather than the bars originally supplied as it is understood that the original bars are melted or sold." On this point, I think John and a lot of people leaving comments about the RBA leasing gold are like the crowd in the Simpson's take on It's a Wonderful Life. 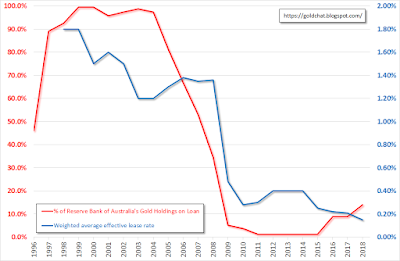 In John's second YouTube he gets stuck into the RBA's audit of Australia's gold reserves at the Bank of England, tipped off by the work and FOIs of Bullion Baron (see this and this post for the background). John makes a number of valid points, the primary one being that it is not a real audit if the RBA is not able to randomly sample from its bar list without direction/limitations by the Bank of England. John's issue with the Bank of England limiting the scope of the sample is that it enables them, given the 6 weeks notice the RBA gives, for the Bank to get bars manufactured with the required serial numbers (which it would only have to do if the Bank has been leasing/selling the RBA's gold without its permission). This scenario is actually close to impossible given how the global refinery accreditation and manufacturing process works. Refineries number bars sequentially, with some numbering since they started refining while others restarting numbering each year (which is why the standard quoted earlier requires year of manufacture on the bar). The entire industry relies upon (and continually audits) refineries to ensure the integrity of the "good delivery" system, as without it global gold trade would break down. Sequential numbering is also a key internal control within a refinery. It is impossible for the Bank of England to call up more than one refinery (as given the way vaults operate and bars allocated, bar lists usually contain bars made by many refineries) and ask for bars to be fabricated with retrospective numbers. The number of people involved in each refiner from the lowest levels plus internal audit/control to perpetuate this level of fraud makes it unlikely to occur, let alone remain a secret. Having said that, John misses the key control breakdown identified by Bullion Baron which is that the Bank of England has it own numbering system and it is an open question from the FOI documents whether the RBA was just given this number or the actual serial number on the bar, as the RBA refused to provide this information. If the former, then this mean the Bank could just find a bar of similar weight (difficult but not impossible given the Bank stores 416,000 400 ounce bars) and say this matches their internal number. It is only the actual serial number stamped on the bar, in conjunction with year and refinery, that uniquely identifies a bar. 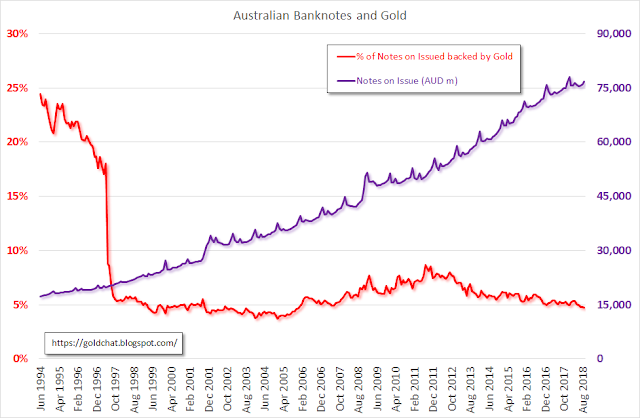 While the RBA is one of the most transparent central banks in respect of reporting on its gold reserves, Bullion Baron's FOIs reveal that they dropped (still drop?) the ball in respect of managing Australia's gold reserves. A case of 1900s "Mother Country" deference-type attitudes or maybe just because Bank of England is seen as one of the "central bank club" and so you can trust your "mates" to do the right thing? p150: "Its [Wall Street] fixed star-money-had left its regular place in the heavens and begun to wander and dance and lurch. For generations the dollar had been held firmly fixed by a force that was accepted in banking circles as being equivalent to a natural law of astronomy, the gold standard-specifically, by the Treasury's pledge to redeem dollars with gold in any quantity for all comers at $20.67 per fine ounce. Now, with that pledge temporarily abrogated in the emergency, the dollar was free to fluctuate in the world markets at the whim of speculators, just like come humbler currency, or indeed, like some untrustworthy common stock. The [first] hundred days [of Roosevelt's presidency] marked the beginning of a unique, and for many people hair-raising, period of almost a year during which the secure wealth for Americans consistend not of gold, which they were now forbidden to possess except for industrial use or in the form of jewelry, and not in money, every possessor of which found himself involved intentionally or not in a game of chance, but in land or goods." p155: "Next day [April 19, 1933] came the public announcement that the country was off the gold standard, and, from Wall Street, some astonishing reactions. ... What was most astonishing of all, though, was the swift and decisive approval of Roosevelt's move by the greatest banker of them all. From 23 Wall came a public message signed by J.P. Morgan-apparently the only formal statement of his career, apart from one that had followed British devaluation in 1931: 'I welcome the reported action of the President ... It seems to me clear that the way out of the depression is to combat and overcome the deflationary forces.'" p162: "But no nation had ever mounted a systematic and concerted attack on its currency, in a time when its gold stocks were ample, for the sole purpose of creating domestic inflation and thus helping debtors. They had not done so because the idea was so outlandish it had never occurred to them. If it had, it would have appeared to their economic ministers as about as sensible as repeatedly hitting oneself on the head with a hammer so it would feel good when one stopped."